Taco Nation dishes California-style tacos from the windows of an old school bus. 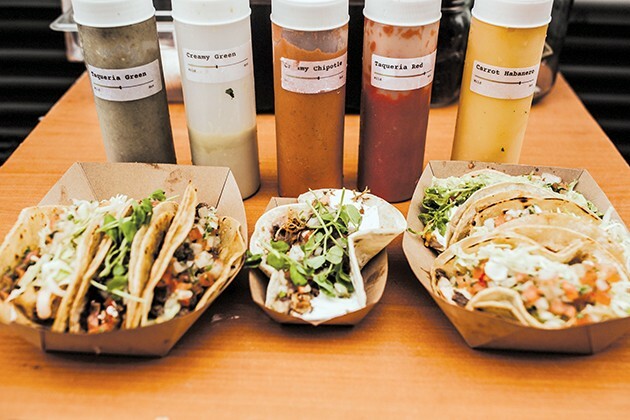 Tacos from Taco Nation feature microgreens from a local farm and fish from Edmond. Cooking for friends helped heal Tim Ulrich at his lowest moment after he and his wife Leanne moved to Oklahoma City from Southern California more than a decade ago. He is now returning the favor with his “weapon of love,” a former school bus. 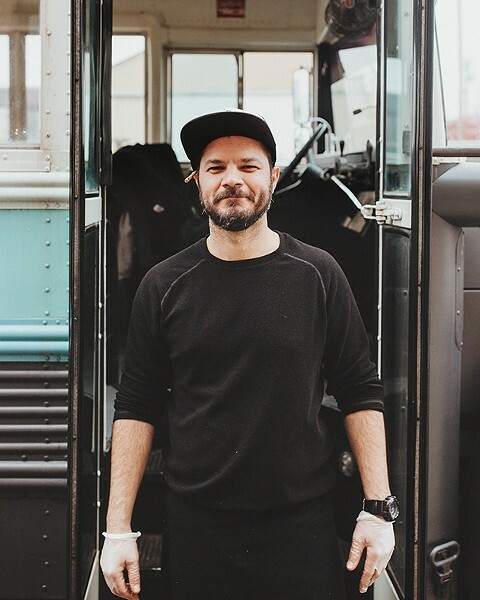 Taco Nation might be Oklahoma City’s most unique mobile eatery, not just because food is served through a 1988 Ford V700 bus that once transported up to 72 kids, but also with its commitment to serving fresh, from-scratch Baja California-style tacos with an emphasis on local ingredients. With the tagline “for the people. 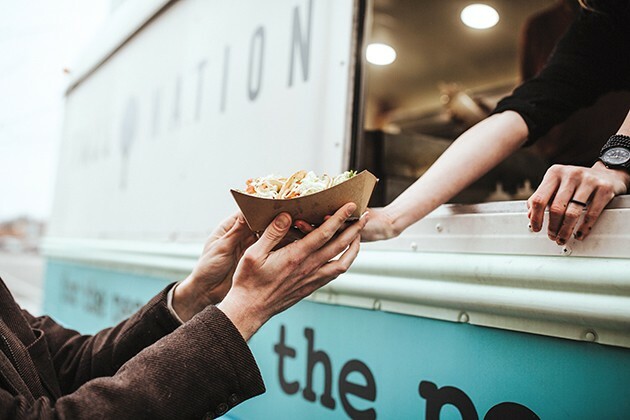 by the people.” painted on the side of the bus, Taco Nation is routinely set up Tuesdays at Stonecloud Brewery, Fridays at Wheeler Park beginning Memorial Day and a variety of other hours and venues across the Oklahoma City metro. 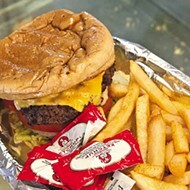 Its most popular item is the Baja taco, which is carne asada with housemade pico de gallo and guacamole sauce. 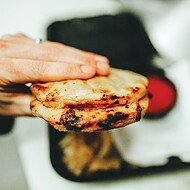 Baja Mexican food or Cal-Mex differs from Tex-Mex with its emphasis on lighter ingredients, vegetables, avocado and perhaps its signature item, the fish taco, which was popularized in the U.S. by the chain Rubio’s Baja Grill in the late 20th century. 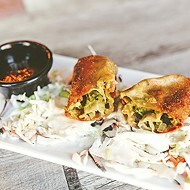 The fish taco, which is made with beer-battered fish from Edmond and paired with a spicy pink “magic sauce,” cabbage and pico de gallo is Taco Nation’s second most popular item, Ulrich said. It also offers shrimp, carnitas, surf and turf (shrimp and carne asada), chicken and vegetarian tacos, all of which can also be ordered as nachos with housemade chips. Taco Nation relaunched for its second season in early March with a new taco, The Okie, which pairs braised pork carnitas with pinto beans, queso fresco, sour cream, pico de gallo and microgreens from local Rooted Farm on a flour tortilla instead of corn. It has also added the option of ordering any taco as a “tacodilla,” — a cross between a taco and quesadilla — for an additional $2. “I want people to taste the love,” Ulrich said, referencing how cooking first made him feel when he and his wife first moved to Oklahoma City about 12 years ago after refocusing property acquisition from California to Oklahoma in 2005 on the advice of a real estate agent. “I was living in my Southern California bubble, and I didn’t even exactly know where Oklahoma City was on the map,” he said. During a trip to the state he bought property in downtown Oklahoma City, The Paseo Arts District and Guthrie. Working on a tight budget, the Ulrichs stopped eating out and gravitated to cooking tacos in a Southern California style in the middle of the land of Tex-Mex. They started to make friends in the neighborhood and eventually moved about six blocks south to what is the former Orndale neighborhood just north of Interstate 40 and east of Western Avenue. Taco Nation retrofitted a 1988 Ford school bus. They started hosting group gatherings, and it was there that Taco Nation was formed. “It was one of those parties and it was 100 people, and our next-door neighbors were helping us cook and we looked at each other [after it was over] like, ‘Man, that was so fun. How do we get the truck going?’ I wasn’t sure at first,” Ulrich said. He told them he would need a generator to even consider opening a food truck. The next day, a neighbor found a Craigslist listing for the bus in Anadarko.